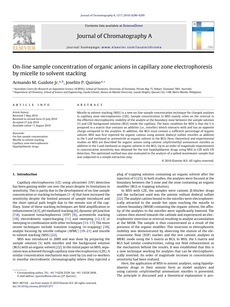 Micelle to solvent stacking (MSS) is a new on-line sample concentration technique for charged analytes in capillary zone electrophoresis (CZE). Sample concentration in MSS mainly relies on the reversal in the effective electrophoretic mobility of the analyte at the boundary zone between the sample solution (S) and CZE background solution (BGS) inside the capillary. The basic condition for MSS is that the S is prepared in a matrix that contains an additive (i.e., micelles) which interacts with and has an opposite charge compared to the analytes. In addition, the BGS must contain a sufficient percentage of organic solvent. MSS was first reported for organic cations using anionic dodecyl sulfate micelles as additive in the S and methanol or acetonitrile as organic solvent in the BGS. Here, theoretical and experimental studies on MSS are described for organic anions using cationic cetyltrimethyl ammonium micelles as additive in the S and methanol as organic solvent in the BGS. 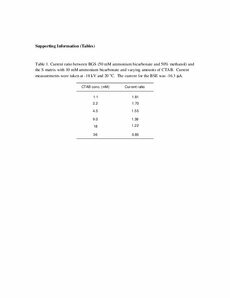 Up to an order of magnitude improvement in concentration sensitivity was obtained for the test hypolipidaemic drugs using MSS in CZE with UV detection. The optimized method was also evaluated to the analysis of a spiked wastewater sample that was subjected to a simple extraction step.